Daredevil Nik Wallenda completed a historic high-wire walk over a section of the Grand Canyon on Sunday, greeted with wild cheers after finishing his journey over the yawning chasm on a five centimetre steel cable. Wallenda, the self-described "King of the High Wire," walked 426.7 metres across the crimson-hued canyon with just the distant ribbon of the Little Colorado River beneath him. The event was broadcast live around the world. The 34-year-old Sarasota, Fla., resident set out Sunday on a cable stretched over the gorge that was eyed by another high-wire performer decades ago. The stunt comes a year after he traversed Niagara Falls, earning a seventh Guinness world record. He used the same five-centimetre-thick cable he used to cross the falls, only this time he didn't wear a safety harness. Wallenda is a seventh-generation high-wire artist and is part of the famous "Flying Wallendas" circus family — a clan that is no stranger to death-defying feats and great tragedy. His great-grandfather, Karl Wallenda, fell during a performance in Puerto Rico and died at the age of 73. Several other family members, including a cousin and an uncle, have perished while performing wire walking stunts. Nik Wallenda, who was born a year after his great-grandfather died, began wire walking at the age of 2, on a 2-foot high stretched rope. He grew up performing with his family and has dreamed of crossing the Grand Canyon since he was a teenager. French high-wire walker Philippe Petit had that same desire and set up a cable above the Little Colorado River, but Navajo officials said he never went through with the stunt and left his equipment there only to be taken down recently by Wallenda's crew. "I don't understand why he didn't," Wallenda said. "It's a site that works, makes sense. He clearly failed at it, so I want to do it successfully." Petit didn't return messages left by The Associated Press. Wallenda wore two cameras, one looking down the mostly dry Little Colorado River bed and one facing straight ahead. His leather shoes with an elk-skin sole helped him keep a grip on the steel cable as he moved across. The stunt was touted as a walk across the Grand Canyon, an area held sacred by many American Indian tribes, and the fulfillment of a dream. 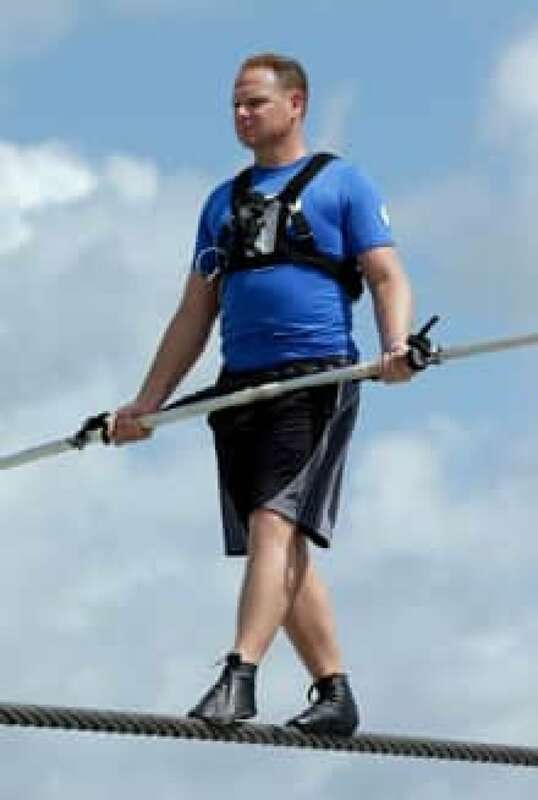 Some local residents believe Wallenda didn't accurately pinpoint the location and also say that the Navajo Nation shouldn't promote the gambling of one man's life for the benefit of tourism. "Mr. Wallenda needs to buy a GPS or somebody give this guy a map," said Milton Tso, president of the Cameron community on the Navajo Nation. "He's not walking across the Grand Canyon, he's walking across the Little Colorado River Gorge on the Navajo Nation. It's misleading and false advertising."